Hosting a corporate gathering, meeting, luncheon, or some other get-together? Send guests home with promotional stress balls as a memento. They’re lightweight and easy to bring back to the office, and they’re fun to keep on the desktop. Tip: Think outside the sphere. Stress balls don’t have to be ball-shaped – they can be custom shapes to fit the theme of your event. More than 60% of illness and disease is a result of stress, according to the American Medical Association. Help your staffers slash their stress with the ultimate stress-busters: custom stress balls. Tip: Give each employee a stress ball and keep some in big, glass jars in conference rooms, too. Try instituting company-wide stress-ball breaks as a way to promote a healthy, relaxed work environment. Do you have a sales team that regularly visits clients? Have them bring imprinted stress balls to meetings. Everybody loves freebies, and it’s a unique way to show that you’re in the business of solving problems. Tip: Use scented stress balls to engage their sense of smell. Depending on the scent, you can promote feelings of energy or relaxation. Stress balls have some serious brand-building power, and they easily fit into most marketing budgets. That’s why they’re ideal giveaways for conferences, tradeshows and other events. Tip: Don’t try to cram too much into the imprint. Stress balls are most effective when customized with a company logo only – not lines and lines of text. 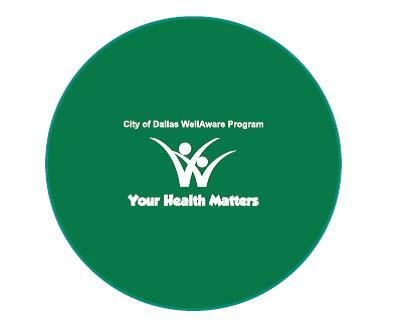 Evans needed custom imprinted stress balls for a presentation on stress the city was conducting as part of its WellAware Program, which is designed to improve the health of employees, retirees and their families. She needed them fast, and as a first-time ePromos customer, she was thrilled with the service we provided. “The customer service was extremely phenomenal,” she raves. Evans had 250 stress balls in assorted colors ready to go at the venue as attendees walked in to the presentation. The promos were perfect for the topic – stress – and they were useful reminders to cope with stress as it happens. When you want to give people a tangible reminder about your business or message, custom stress balls can be a fun, creative way to do it. People naturally want to give stress balls a squeeze, and when they do, your logo will be right there. Want more on these palm-sized promos? Here are four things you didn’t know about promotional stress balls. Custom t-shirts are like badges of honor for participating in a race. People love receiving them and showing them off. When it comes to giveaways for marathons, races, walkathons and the like, promo t-shirts will always be a favorite. Here’s an example of why they work so well. 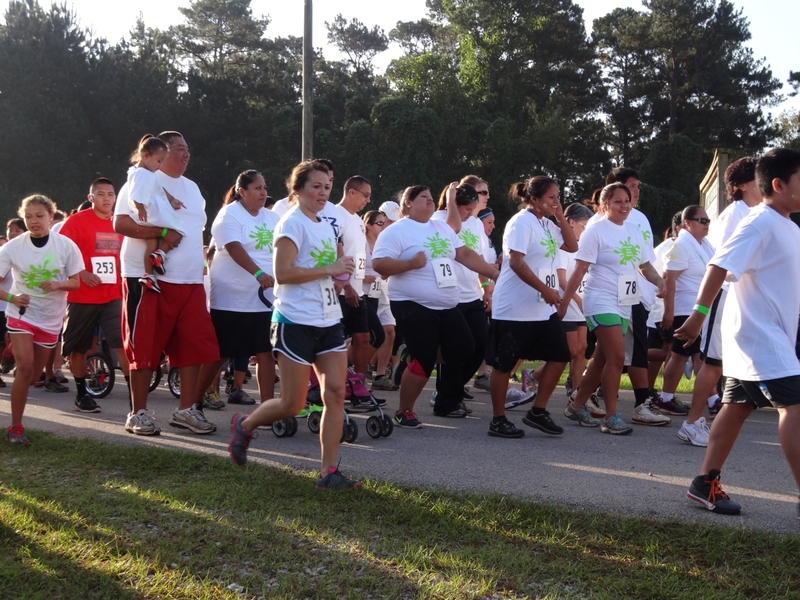 Our client, Choctaw Behavioral Health, an agency that promotes healthy, substance-free living in Choctaw communities, hosted a 5K race and one-mile fun run. 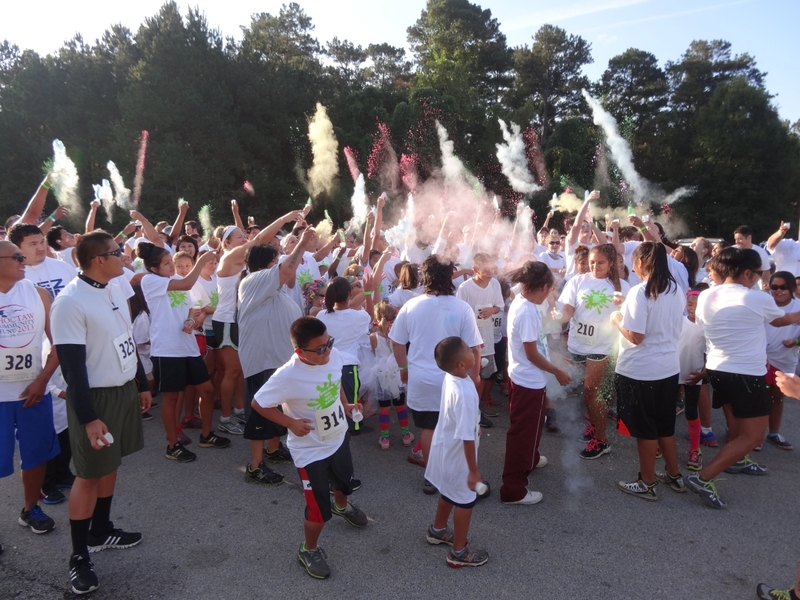 Called “Color Me Rez,” the color run was the first of its kind for the Mississippi Band of Choctaw Indians’ Pearl River Reservation. The event was created to help raise money for a new cultural center. To boost registration numbers, Heather Glenn, MPP Grant Coordinator, contacted ePromos for custom t-shirts. “One thing all people love on the reservation is a free t-shirt,” she says. On race day, those who were pre-registered got their shirts from the t-shirt table and volunteers. The white custom t-shirts featured a neon green paint splash in the center with the name and year of the event. They were the perfect canvas when colored powder was tossed up into the air. Even people who weren’t involved in the race wanted a free shirt. “People liked the shirts so much they wanted one for themselves,” says Glenn. Just like giant foam fingers are great at sporting events, custom t-shirts are perfect for races. 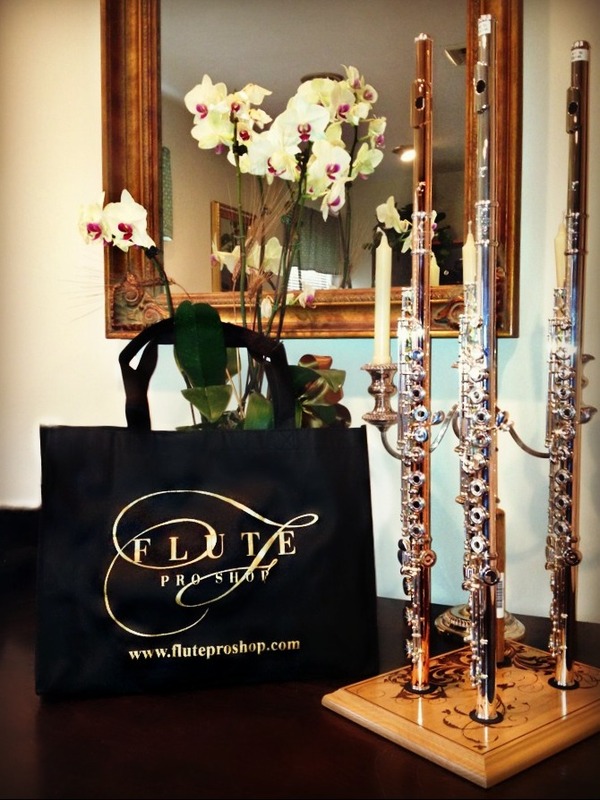 They’re one of those tried-and-true promo items that people simply love receiving. And they just make sense for the event. Participants can wear them during the race, and they have a tangible memento after it’s over. Marathon organizers take note: Custom t-shirts are a must for promoting your event and providing people with a token of participation. Custom koozies, those handy foam or fabric devices to insulate drinks, are a must if you’re planning a class reunion. You can add your school logo or mascot, or even a clever saying about your class year, and voila: You have a great favor for the event. You don’t have to spend a lot of money for your giveaways to be the hit of the party. Many custom koozies are priced well under a buck a piece. This means you don’t have to bust the budget for the alum and his or her significant other to take home a favor. 2. People can use them right away. Koozies aren’t giveaways that get stashed in a purse or bag for later – they get used immediately. Whether attendees are sipping soda, beer or bottled water, promo koozies keep those beverages cold. Every time people use the koozies, they’ll think back on the class reunion – and that goes back to the reason above. Give people something they can use on the spot, and your giveaway will spur memories of the event every time it’s used. 4. They fit the party atmosphere. Class reunions are all about good times and bringing people together. When attendees are enjoying cold drinks and mixing with old friends, promotional koozies fit right in. That’s why they’re so popular at weddings. When it’s a festive environment and people are imbibing, koozies are a great fit. 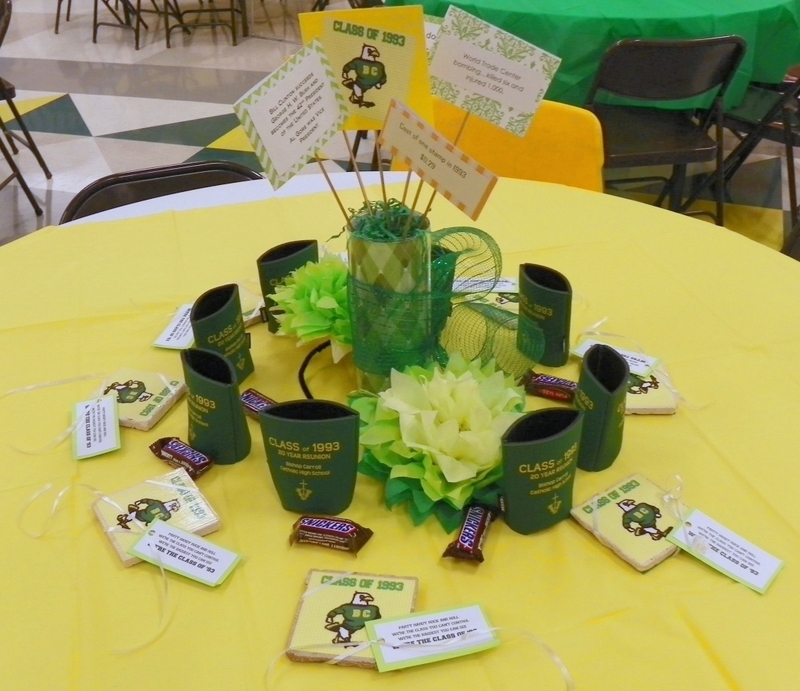 ePromos provided more than 100 promo koozies for our client, Leah Pollock, who helped organize the 20-year reunion for Bishop Carroll Catholic High School, a private high school in Wichita, Kansas. The koozies were incorporated into place settings, making a nice presentation as attendees sat down to dinner. When people take the time and make the investment to attend a class reunion, give them promotional products that show off their alma mater. Custom koozies are ideal party favors – whether they’re included in place settings as our client has done, or they’re given to attendees in another way. Let our Brand Consultants discuss some creative ways to kick up your class reunion with custom koozies. We want to hear from you: What promo products do you love to receive at class reunions, weddings, parties and other events? Luncheons. Awards. Education sessions. This is the stuff typical of National Case Management Week. But what about a winning promotional idea? What’s a way to show case managers how much they’re appreciated? After all, that’s what the week was designed for: to recognize the contributions these professionals make in the healthcare industry. Here’s a thoughtful promotional idea from our client, Arkansas BlueCross BlueShield. The company, Arkansas’ largest health insurer, used custom pint glasses for National Case Management Week a few years back, which is celebrated October 7th – 13th this year. The pint glasses were filled with treats – candy, cookies or crackers – and wrapped in cellophane with a bow as the finishing touch. The gifts were then hand-delivered to nearly 200 staff members by management. Angelia Bethea, Blue Advantage National Accounts Quality Program Manager, says the promo gifts were exactly what the staff needed – the company no longer supplies Styrofoam cups. This promotional idea was just the way for BlueCross BlueShield to fill a need while providing a token of appreciation at the same time. 1. It had “appreciation” written all over it. These logo pint glasses weren’t dropped off on desks unfilled – they were dressed up with a bow and filled with something good to eat. BlueCross BlueShield took the promo even further by delivering them to staff members. This allowed them to say thanks face-to-face and to put a tangible gift right into employees’ hands. 2. The pint glasses were immediately useful. With no Styrofoam cups in the breakroom anymore, staffers must bring their own drinkware to fill up at the water fountain. 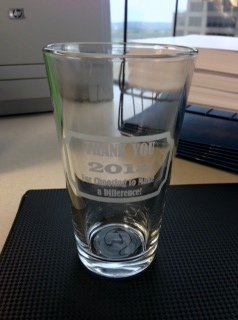 BlueCross BlueShield swooped in with a solution (and a thank-you) with the custom drinkware. It’s always smart to think about what recipients might need, and then provide promo items to fill that need. 3. The gifts had a high-end feel. Glass drinkware – whether it’s pint glasses, coffee mugs or champagne flutes – have a high-perceived value. People feel like they’re getting a substantial gift when they receive glassware. When the goal is to show how much you value employees or customers, logo glassware is the way to go. And even though it looks expensive, it’s not. Many glass drinkware items are well under two bucks a piece. When you begin prepping for National Case Management Week 2018 – or anytime you want to show appreciation to your team – make sure you have a great promotional idea to make the occasion special. Tap ePromos’ expert Brand Consultants for creative ideas and guidance. Promo products can take your social media efforts to the next level – whether your brand is just getting started or you want to stir up some engagement. Promotional items get people talking about your brand. They can drive people directly to your social sites, whether you print your link or handle, or even a QR code on the products. It doesn’t matter if your company is active on one social network or 10 – when you want to get the word out and generate some excitement, promo products are the way to go. 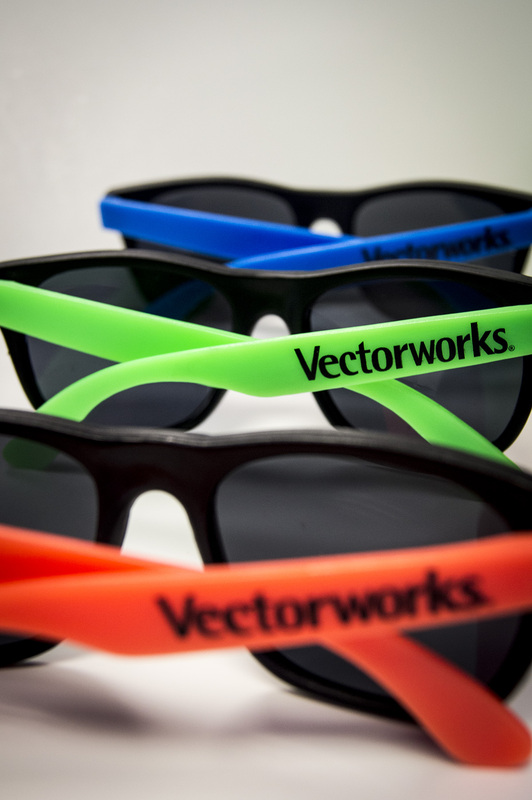 Our client, Nemetschek Vectorworks, is using promotional products to enhance its social media presence. The company, a global leader in 3D design technology, has been developing design software for nearly 30 years. Its users primarily include architects and designers, and also students about to begin their careers. When Nemetschek Vectorworks created an Instagram account last month, it naturally wanted to attract college students and young professionals. People age 18-29 are the highest users of social media, with 89% of this group using social networking sites regularly, according to Pew Research. ePromos’ solution was simple: great swag that appeals to college students. 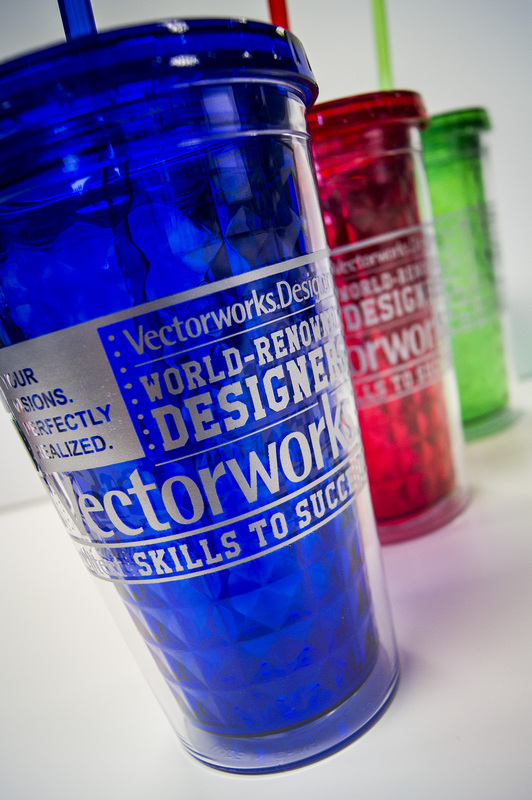 We presented Nemetschek Vectorworks with diamond-patterned custom tumblers and always-cool promotional sunglasses. When giving out promotional drinkware, think about including some extras such as custom packets of tea, coffee or candy. Many of our clients have also tied on a business card or marketing piece with some ribbon. Nemetschek Vectorworks did both. It filled the tumblers with candy and attached a card printed with a call-to-action: Follow us on Instagram. So, do the promos resonate with the college crowd? Think like Nemetschek Vectorworks and use promotional products to kick your social media presence into high gear. Don’t wait for your fans to find you – make it easy by putting a tangible reminder of your social sites (and your brand) directly in their hands.